I’ve been in this business a while and I’ve seen a lot. I’ve had some successes and made some mistakes. Here’s eleven random things I’ve learned along the way about managing people, and about myself, and one thing that I still haven’t figured out. I used to think the goal of management was to “keep the trains running on time”. The problem is, trains can’t run on time if they don’t have a clear understanding of where they’re supposed to be and when. Setting clear expectations for your team is essential. If your people don’t know your expectations, they’ll never live up to them. It took me quite a while to learn this lesson, and I’m sure it cost me a few good people along the way, but I understand it now. Talented people need your wisdom; not your rules. Rules are made to keep people from hurting themselves, so there’s a place for them in every organization. Best practices are there so we can build on our experiences and make better decisions as we attempt to grow and do new things. Share and focus on best practices – your wisdom – instead of making rules. Everyone answers to someone, which means not everything is in your client’s control. Depending on the client, there may be several layers of approvals and opinions for them to navigate. And while today’s ad may be your only priority, they probably have several others demanding their attention. (Almost) no one comes to work to do a bad job. They’re either unclear of what your expectations are or they simply aren’t able, or willing, to work to them. Don’t take it personally. Just figure which one it is and act quickly and accordingly. There’s a great quote from FDR (or someone important) that goes something like this: "In any situation, the best you can do is the right thing, the second best thing is the wrong thing and the worst thing is nothing." Sitting on it won’t make it any better. Make a decision and deal with the consequences. There is a process for everything that happens in an agency. Some are informal and others are well defined but they’re there if you know how to look for them. Capture them. Record them. Share them. Because they make deciding what to do next a whole lot easier and clearer for everyone. You can’t build relationships by email. 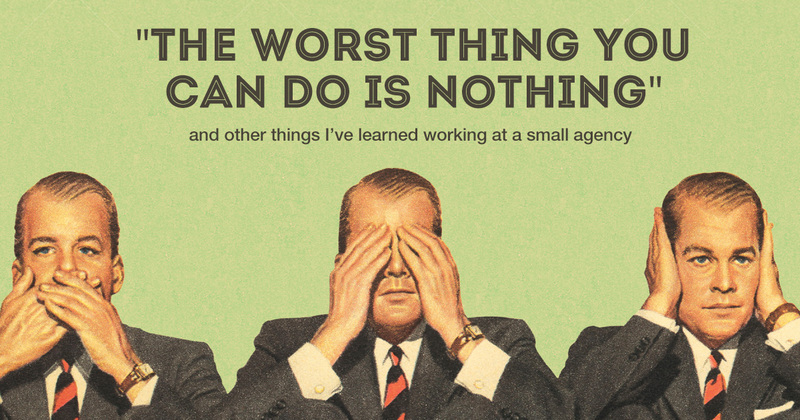 We’re in a service business – good account managers get it and weak ones don’t. It’s impossible to build a relationship by email and without a relationship, you’ve got nothing. Always call about anything important. And when you do need to email, follow up with a call. Selling and executing them is the hard part. I attended a portfolio school specifically for copywriters and the emphasis was wholly on ideas. Ideas are the easy part. Give me a well-written creative brief and 8 hours and I’ll give you some ideas. What’s hard is finding ways to make the good ones happen. Creatives need to present their own work. When the ideas aren’t flowing, nothing lights a fire under a creative like knowing they’re going to have to stand up in front of room full of people and explain their work. Your work does not define you. It took me a long time to figure this one out but it really is just a job. Jobs come and go but your family is with you for life. Always remember that. Always put a number in your blog post title; people love it. Admittedly it's a little cheap. But content marketing is all the rage, right? The secret to it all. If there is one, I haven’t found it yet. If you know what it is, please email me. I’d greatly appreciate it.